In this gorgeous little cookbook, television chef Lucinda Scala Quinn collects her all-time favorite Italian recipes, drawn from her Italian-American childhood as well as her two decades of travel throughout Italy. Accompanied by lush color photographs and Quinn's evocative reminiscences, the 52 dishes included are easy to make, beautiful to look at, and delicious to eat. There are appetizers such as Miniature Meatball Panini, pastas like Linguini with Clams (Lucinda's favorite), soups such as Stracciatella (rag soup, Lucinda's childhood comfort food), main dishes such as Chicken Milanese, and desserts like Espresso Granita. 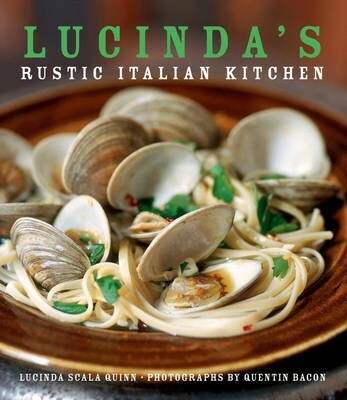 For anyone who wants to enjoy home-style Italian cooking at its very best, Lucinda's Rustic Italian Kitchen is the perfect kitchen companion--and an irresistible gift.